Love My Mom this Saturday! 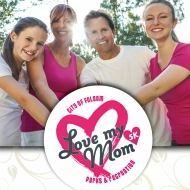 A Join us as we honor and celebrate moms and their tireless commitment to family and community at this new 5K run and walk! This fun event encourages family and friends to embrace a healthy lifestyle as they share a morning of exercise. Participants may run or walk; the course is timed with awards in various age categories.